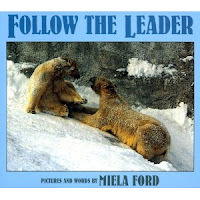 One of my favorite polar bear books! I could SWEAR that I'd blogged this, but it may have been long ago on the original "Library Lady Rants" blog, and it's one of my favorite games! Most people know and do a version of "I'm Going On A Bear Hunt" and this winter variation is just as much fun, maybe even more so. I'm going to give you a general outline of how to play this game, but my advice is let the children lead the way. Don't stick to a script! Their suggestions make this game even better and really draws them in.And it's building thinking and language skills while having fun. My favorite recollection of the Polar Bear Hunt is playing it with the pre-K class from my favorite local preschool and having their teacher report later that the kids went back to school STILL pretending to be cold from being out in the snow. Now that's the magic of story time! I tell the kids:"We're going to go on a hike in the Arctic and see if we can see some polar bears"
What clothes do you need to wear? One thing we've added is dark glasses because it's so bright in the snow! Walk on the snow. Take big steps. Fall down if it's slippery! Climb up a hill of snow and look for polar bears. But you won't see one--it'll be something else! Slide down, or ride on a sled. Sometimes we fall off our sleds. One time one of the kids said her sled was broken and another kid "repaired" it with his "tool kit"! Ice skate--because you were smart enough to carry skates with you! Climb up an icy cliff. Good thing you had that rope and those special climbing shoes with you! Again, this is an idea outline, NOT a script! Please improvise and let the kids help you! It's warm in the cave and dark.Do you hear snoring? Reach out. Do you feel something furry? Pet it very gently. We don't want to wake the bear--it might get mad! Crawl quietly out of the cave and reverse some of your actions to go home. Before you go back through the door, stop. Do you see something out on the ice? It's a polar bear! It's a mom polar bear and a baby. Wave to them! IT'S COLD! TIME TO GO IN!! Before you go inside, don't forget to wipe your feet! Open the door, and go inside. Make some hot chocolate. Do you like marshmallows in your cup? What a great polar bear hunt! This is such an adorable, sweet, creative idea! I will definitely be using it in a few weeks when we share Polar Bear stories. My favorite part has to be the idea of petting the polar bear gently. Love that! Btw, that is one of my favorite polar bear books, too. Beautiful photographs!